Everyone wants to eat healthier, but pulling together a healthy meal at home can sometimes feel like a daunting task. Often we get stuck in a cycle of running out of time and ideas at the end of the day and resorting to unhealthy takeout or frozen food. But there is a better way that is not only healthier — it’s easier, less stressful, and saves money, too. As a busy mother of two, cookbook author and family dinner advocate Aviva Goldfarb has discovered that the key to making healthy meals a reality is simple: Plan several easy, healthy meals in advance and grocery shop once a week with a list. 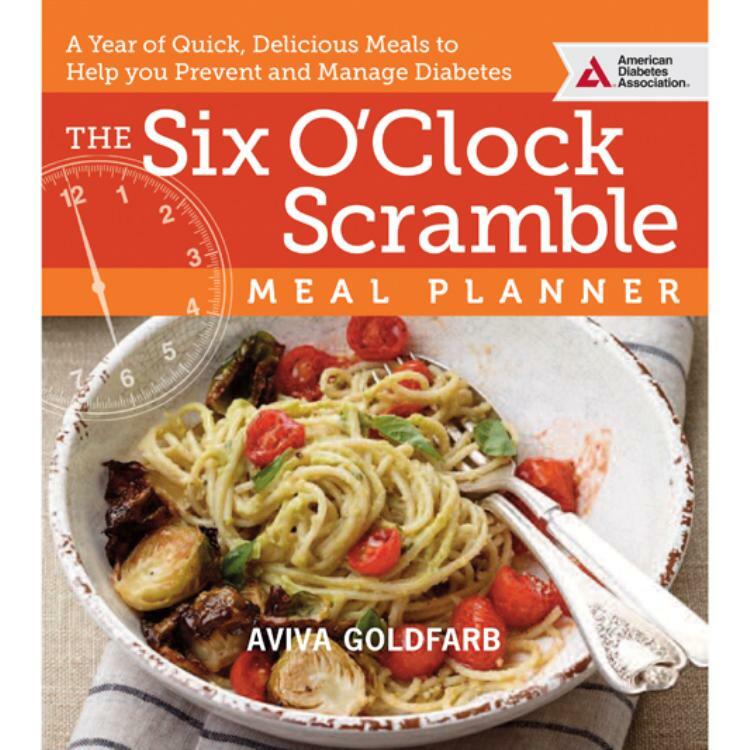 The Six O’Clock Scramble Meal Planner saves precious time with a streamlined system for fast and easy diabetes-friendly family dinners. Inside, readers find a healthy,balanced dinner plan for the week, including side dishes and a grocery list, recipes that require 30-minutes or less to prepare, tips for timing sides, an organized grocery list to keep shopping to a minimum, and much more. Of course, the foundation is hundreds of delicious recipes that are built on natural, fresh ingredients. department at (703)299-2056 for pricing. I was talking to a friend about how great this book is and she said, oh, I thought about getting that book but I saw it was a diabetes cookbook so I figured it had weird ingredients. No! There are no weird ingredients at all in this book! Just delicious and nutritious, real food, seasonally organized meals that everyone can eat and will love! So far my favorite is the Pesto Vegetable Soup with Chicken! So delicious and perfect as the weather has been so cold where we live! If you have diabetes this book will surely help you manage it but if you don't have diabetes this book will keep you on track to prevent it. Highly recommended! This book has countless yummy recipes! I liked the fact that the grocery lists are coded so if you choose not to make a particular dish its easy to take off of your grocery list. I started with winter, week 1 and the maple chicken was delicious! Both soups that week were also fantastic and extremely easy to prepare (which is my favorite part). The only recipe my family didn't care for was the succulent salmon. Overall though, it was a week of delicious and healthy meals. I really love that each dinner recipe also comes with a quick side dish recipe! I found that I needed to add some extra seasoning here and there but my family is also not diabetic and my husband is from the Carribean, so we love our spices! This book is highly recommended for diabetics, or people like me just looking for an easier way to prepare fresh and quick dinners to enjoy. It also seemed to follow the priciples of a Mediterranean diet which is proven to be healthiest for us. :) This book will not disappoint you! Natural flavor boosters - who needs excessive salt, fat and sugar? In 2016 I committed to reducing sugar and highly processed foods in my diet. The Six O'Clock Scramble Meal Planner helps me keep my commitment by offering an amazing variety of healthy, delicious foods that are easy to prepare and inexpensive.The book is organized by seasons, which encourages me to take advantage of the best seasonal produce. The format also makes it easy to plan menus that fit the vibe of the season. The shopping lists, as well as the pairings of main dishes and sides, take the guess work out of planning complete meals. Unlike many cookbooks, the book is written in a style that takes the intimidation out of trying new foods and techniques. I also find that the recipes are flexible, so I can make substitutions or additions to recipes based on my own taste or what I happen to have on hand. This book is a home run! The recipe for Grilled Chicken Breasts with Cajun Rub is terrific. I enjoyed it over a garden salad. Who needs to buy packaged Cajun seasonings with all of the added salt and preservatives when everything you need to make your own is in your spice rack? The rub gave the chicken beautiful grill marks. I also made the Tilapia Packets with Fresh Herbs and Baby Spinach, along with its pairing, the Roasted Brussels Sprouts. So colorful, easy, delicious, and good for you! If you are not yet concerned about added sugar and highly processed food, you or someone you love will be concerned, eventually. This book is a much-needed head start. The Six O'Clock Scramble Meal Planner makes it easy to choose wisely without feeling regimented or deprived. If the book sparks your interest, you can also visit thescramble.com for more recipes and ideas. I refer to the website often! Healthy, Delicious Meals perfect for your family! I have used Aviva's Six O'Clock Scramble recipes for years. As a full-time working mom, it is so nice to be able to head to the grocery store ONCE a week, buy everything I need for a week of meals and know ahead of time what I'm making each day. Some weekends I make 2-3 meals just to get us through a particularly crazy week. Her recipes always include sides and assist with the timing (I.e. Her recipes tell you if you need to start the side before the main dish, etc.). I started using her recipes when my girls were 3 and 7. They have always loved all the meals which is such a relief (after spending time in the kitchen, who wants to hear "I don't like this!"). My husband also raves over the recipes. I was able to test drive a few recipes from this cookbook. I was so happy to see I could still take a list of groceries to the store to make meals for the week (a life saver for me). I made the orecchiette with broccoli, the garlic baked potato soup, the tilapia with lemon and capers, the baked burritos and chicken fingers. As usual, all meals were met with rave reviews from my family and gobbled right up. The ingredients chosen are always healthy options, and as I mentioned before the included sides relieve the burden of finding something to go with your dinner! The orecchiette was a very quick meal to prepare, and probably received the most fanfare from my family. The tilapia was also incredibly simple to make, and my ten year old had seconds commenting that she loved capers and the citrus flavor. I used the crockpot option (another fantastic feature of Aviva's recipes) to make the baked potato soup. It was a little bland until we added the bacon, cheese and sour cream toppings. Again, the kids loved the recipe and had no problem finishing dinner. We had leftover burrito filling (another kid favorite as they cheered when they saw me making them) which I used on tortilla chips the next day for lunch. If you are looking for quick, healthy recipes that your family will enjoy, I highly recommend this cookbook. If you would benefit from planning a week of meals and making only one grocery run a week, you NEED this cookbook!! I am a long-time fan of the Six O'Clock Scramble... I've used Aviva Goldfarb's menu service for many years and both her weekly system and the recipes themselves are always top notch. First, the system... she plans your weekly menus for you, including side dishes for each meal, and provides the shopping list broken down by the areas in the store where you will find things (i.e produce, refrigerated items, etc.). The menus are arranged seasonally to take advantage of fresh produce available in warm months and give you more comfort food to enjoy in colder months. The system works really well for me. It's basically point and shoot... I take the shopping list, buy the groceries, make the food... that whole logistical/decision-making side is streamlined. So easy! Then, the recipes... I love Aviva’s recipes. There is a nice variety of nutritious, simple, tasty meals every week. If you are a meat and potatoes family, this will not work for you. But it's exactly how I like to eat... many vegetarian options, frequent chicken and fish recipes, occasional red meat. It works very well for me and my family's preferences. In addition, she provides the side dishes and tells you when to make them while you're cooking the main dish so everything is done at the same time. Her recipes are pretty foolproof, and that's saying something for me. I have made hundreds, maybe thousands(!) of Aviva’s recipes over the 12+ years I have subscribed to her service, and they are, nearly without fail, delicious! Examples from this cookbook... I made the Week 1 Winter recipes this past week. •	Baked chicken with maple butter glaze – not everyone in my family likes chicken on the bone so I hesitated a little, but this recipe worked out really well. The chicken is so juicy and flavorful and this dish is extremely easy to make! •	Succulent salmon with caramelized onions – I so appreciate how Aviva has managed to bring delicious fish dishes regularly into my family's diet… this recipe is another excellent salmon dish, so healthful. The side dish for this recipe, farro, is another new addition for us… sort of like couscous, we’ve come to really enjoy exploring new foods with these recipes. •	Pesto vegetable soup with tofu – Delish comfort food and you can use chicken instead of tofu, but it’s really good with the tofu. And garlic toast! How can you go wrong with that! •	Spicy slow-cooked Indian Dal – I made this in the crockpot last Sunday and the house smelled so good all day. This delicious lentil stew was a hit with my kids and I continued to enjoy leftovers for lunch during the work week. •	Vegetarian enchiladas verdes – another winner with my kids. The cremini mushrooms in this dish taste like meat… so flavorful. I love that Aviva can get my kids to eat veggies regularly… these enchiladas are filled with spinach, but so delicious that no one said a thing while they were stuffing them down! This was a typical week of Scramble cooking… the planning done for me, the shopping streamlined, the recipes easy and nutritious, and happy tummies for my family. I have two kids… one picky and one adventurous. I can usually pull out ingredients (plain chicken, etc.) to make the picky one happy, but he tries everything and I figure some day he’ll develop a wider palate. I can honestly say that Aviva taught me to cook... her recipes have made it possible for me to feed my family healthy meals day in and day out for over a decade. They save me time and money... my shopping is streamlined, I rarely go to the store more than once a week, and we usually eat at home because I have something to cook... no need to go out to restaurants at the last minute. I also have leftovers to take to work for lunch nearly every day. This cookbook is a great addition to the Scramble repertoire. If you want a variety of tasty and nutritious recipes and an easy system for getting them on your table, you will not be disappointed! Just ordering, we will see. ...and I rated it that because for whatever reason, this website forces me to rate a product I was only looking at as a possible future purchase just before I registered to even be able to look at the book collection, not one I actually made already. This is THE official ADA website, right?